One character will doubt the one she loves most. Another will continue living the personal hell that comes with a lack of belief in anything positive. Unrequited love, shoe shopping, stolen Easter eggs, designer bird houses and species identity confusion will also play a part in what shapes up to be the busiest holiday of not only any Peanuts special specifically, but of all other specials as well! 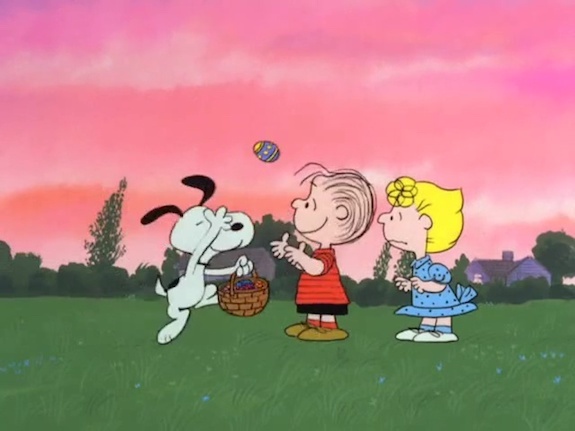 And the Easter Beagle is precisely what this group of grade school sad sacks need! Everywhere you turn, Easter is on the precipice of being totally ruined! Sally might have to buy out of style pink platform shoes because they are cheaper than newer ones! Woodstock is homeless due to a flood in his nest! And worst of all, the George and Lenny of Charlie Brown’s world, Peppermint Patty and Marcy are at their wits’ end trying to figure out how to make Marcy understand the proper way to dye Easter eggs! Every committed, loving relationship will inevitably have to weather some storms if it is to survive. Like many couples, Patty and Marcy find that the stress of the holidays is threatening to break these sapphic soulmates apart forever! 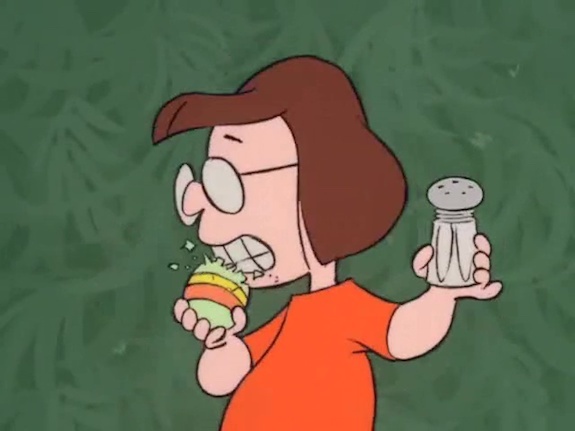 After all, how many freaking dozens of eggs can Peppermint Patty be expected to go through in a vain effort to get Marcy to color Easter eggs? They can’t even get past the boiling the eggs part! Marcy, demonstrating all the intelligence of a low functioning alien just arrived on Earth uses a waffle maker on the eggs, puts them in the oven and even tries to jam them in a toaster! Showing the patience of a million Jobs, Patty finally is very explicit in telling Marcy they need to be boiled first. So Marcy promptly cracks the eggs open and dumps them in the boiling water! By the time Patty is wondering why it smells like egg soup, you can’t help but laugh while cringing at the distinct possibility that Marcy will be spending Easter in the burn unit, while Patty is being held somewhere without bond! Meanwhile Linus is preaching the Gospel of the Easter Beagle whenever he gets the chance resulting in all sorts of suspicious looks and snide comments, culminating in the now classic piece of advice, “never trust a man with a blanket” made all the more cutting that it came not from his arrogant know-it-all sister Lucy, but from his obsessed stalker, Sally! 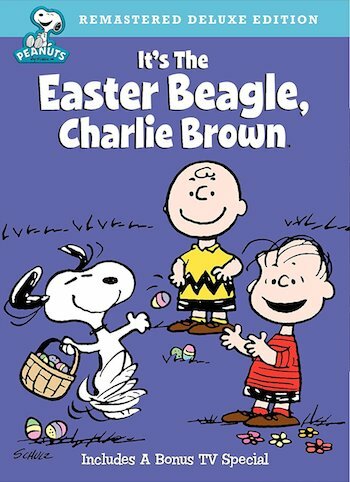 The mission for the Easter Beagle then (if he truly exists) is simple: dance into everyone’s lives Easter morning, handing out eggs to mend relationships, rescue that blockhead Charlie Brown from his usual holiday moping, put that uppity Lucy in her place and restore a young girl’s faith in her delusional crush! Frankly, if this was up to anyone but Snoopy, I’d say there was as much chance of all this happening as any of the Peanuts gang not ending up on government assistance when they reach adulthood. But Snoopy fought the Red Baron in the Great War! Do you really think that wrapping up a myriad of plot threads in the waning moments of the program, saving Easter for all involved (except for Charlie Brown of course – his loserdom is as unavoidable as the spring thaw) and perpetuating Sally’s unhealthy co-dependency as well as Linus’s bizarre fixation on inventing strange supernatural beings is going to tax our floppy-eared hero? A joyous antidote to the classic misery in such Peanuts specials as It’s the Great Pumpkin, Charlie Brown and Be My Valentine, Charlie Brown, It’s the Easter Beagle, Charlie Brown! not only ends on a couple of high notes (Snoopy delivering eggs while dancing, kissing Lucy to diffuse her rage at him for stealing her eggs), but is a more lighthearted effort throughout with the over-the-top antics of Patty and Marcy (including Patty somehow mistaking Snoopy for a human boy) and the kids goofing around at the department store. 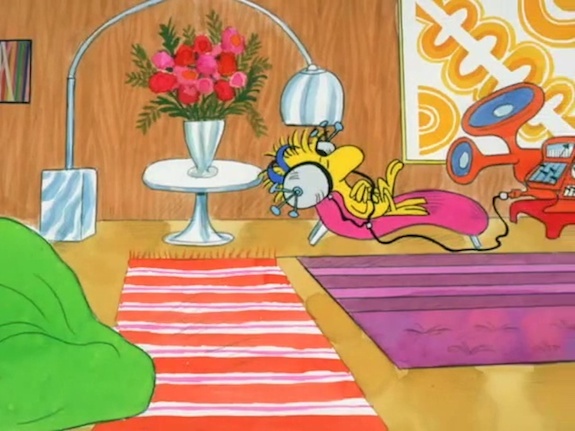 Even Woodstock’s housing issues are treated as comic relief (try not to smile when you see Woodstock chilling with a pair of headphones on surrounded by his “mod” furniture). Only Charlie Brown tries to bring things down at the end, but he played no substantive role in the story and it comes off as forced, like the filmmakers felt obligated to get his “woe is me” gimmick in somehow. After so many depressing and/or heavy entries in the series, it was a breath of fresh air to just have a good time watching Snoopy mixing it up with Patty, Marcy, Sally and Lucy without having to ponder the casual cruelties of a cold, unfeeling universe. Are these children’s holiday specials or H.P. Lovecraft stories? Those other specials may be great art, but damn it, these kids have earned a little hope in their lives. And if it’s brought by a dancing, egg-stealing dog, who among us can ask for anything more than that?